Small-sized Mode Locking Yb Fiber Laser Kit | Kokyo, Inc. 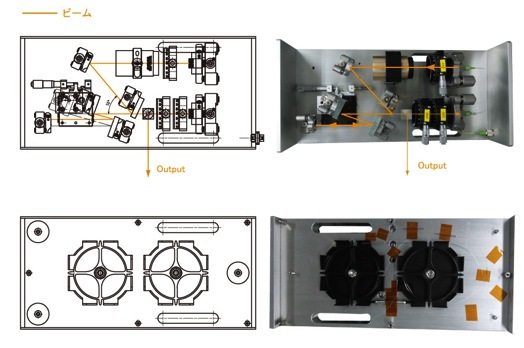 This is a small-sized mode Locking Yb Fiber Laser Kit having product-level stability and compactness. This kit works on NPR (Nonlinear Polarization Rotation) as a principle of ultrashort pulse light generation and provides stable ultrashort laser thanks to its elaborate design in spite of the compact body. ::What is an “Ultrashort pulse laser” ? ::What is “fiber laser” ? The housing is prepared to accommodate various optical parts therein. You can easily build up a desirable optical system by installing optical parts according to the guidance given by the assembling instruction manual.Because the optical system is mounted inside the housing, influence of external disturbance factors such as air turbulence the laboratory and so on, are suppressed.Originally the spectral width is greater than 50 nm, and the pulse width can also be set to less than 100 fs by an externally provided pulse compressor. As an external pulse compressor, we recommend a transmission type diffraction grating of the polarization dependent type and having a high diffraction efficiency. ::What is “pulse compression by a diffraction grating” ? *2 A connector on the front side is an input port for a pump LD. *Specifications are subject to change by external factors such as alignment of the optical parts assembled or the fiber length, and so on. ＊A power source for a semiconductor laser is not included. ＊Inform us if you do not have a fusion splicer. *For getting a higher intensity, you can use this kit together with a fiber amplifier kit or a high pulse energy type femtosecond regeneration amplifying kit.